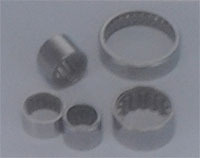 Magnetic clutch bearings with high sealing performance, high mement rigdity, and long life. High durability under alternative collant (non-freon type) and high rotating speed. Long life for high temperature and brush wear particie conditions have been achived with special greese. EPS motor bearings for few forque vibration, and hight reliability.